Yesterday I received a copy of the Archipendium 2012 Architecture Calendar. Yes, it's a little late in the year to receive a calendar, but I made it a "test drive" to help people decide if they want to get the 2013 edition now available. As can be seen below, it is a daily "tear-off" calendar with one building every day that is about 4.25x5.5 inches (11x14 cm), with a hole near the top for mounting on a wall. 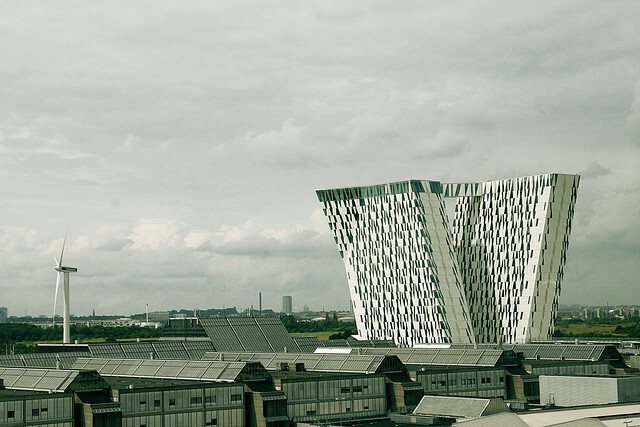 Here are a couple photos of Bella Sky Comwell Hotel in Ørestad, Copenhagen, Denmark by 3XN Architects (2011). Photographs are by trevor.patt. On Tuesday evening I attended the lecture for the 2012 World Monuments Fund/Knoll Modernism Prize, given to the Architectural Consortium for Hizuchi Elementary School for their restoration of Hizuchi Elementary School in Hizuchi, Yawatahama City, Ehime Prefecture, on Shikoku Island, Japan. Here are some photos of the Traverse Hilversum in Hilversum, Netherlands, by Meyer en Van Schooten Architecten (2011). Photographs are by Klaas Vermaas. Here are some photos of the Lafayette College Arts Plaza on their Williams Arts Campus in Easton, Pennsylvania, by Spillman Farmer Architects (2011). Photographs are by Vicki Liantonio courtesy Spillman Farmer Architects' flickr page.